Sometimes I am reminded of just how different my Dancer is now compared to just a couple of years ago. The last couple of days they’ve had their hay topped up very early compared to normal. The reliable stimulus predicting hay arriving was …either me or Chris walking into the field. Just a year or so ago, the visual cue of a person arriving triggered fence walking, whinnying, pawing the gate if in the field, or bouncing up and down, weaving and piaffing and a whole host of other displacement (stress related) behaviours whether in the field or stable. Why? Because her behaviour had been reinforced time and time and time again throughout her life by myself as well as the many other people who have looked after her over the years. Eye contact, talking to her, going to her (attention from a human) as well as being brought in to food in a stable or hay being given in the field shortly afterwards. As such, Dancers attention seeking behaviours were very, very deeply learned and it’s taken A LOT of dedicated and structured training to allow them all to extinguish (run to extinction). If ANY behaviour is maintained or increases in frequency, it’s being reinforced in some way (if it’s not reinforced, it will reduce in frequency and eventually extinguish completely). This morning highlighted to me just how far she’s come. Two days in a row of the old trigger (human arriving) being reliably positively reinforced (paired with being given food) and this morning I deliberately went out and poo picked instead of giving them their hay straight away. Just a year ago, this would have produced all the stress related displacement behaviours listed above and her attention seeking would simply not have stopped. She would have been hysterical. Yet today she came and sniffed the barrow, gave me a cuddle and then mooched off calmly and happily as this picture shows. NB. There have been enormous management changes too, her 3 F’s (Freedom, Forage and Friends) are met, which has played an enormous part in achieving this but much of it was in the training – recognising the triggers that started the stress behaviours, recognising what was reinforcing those behaviours (ie maintaining them) and deliberately changing those consequences from her continually gaining something appetitive (of value) to withholding that appetitive. By being aware of what is reinforcing something and what is triggering it, we can change any behaviour(s) and that Is just a question of understanding the science of learning – How Horses Learn. I wanted to change things for Dancer because being that stressed isn’t healthy. 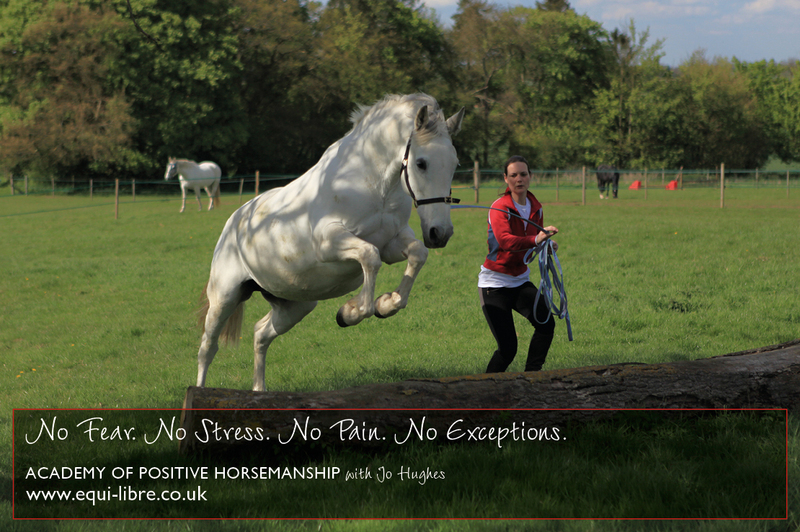 She is now a very happy, relaxed, contented and non stressed horse.